The area covered on this page was previously mainly industrial, as can be seen on the 1952 map. Included here are streets formed on an area of Granton Harbour that was infilled after World War II. Development has mostly been since 2000, as part of the Waterfront Edinburgh project. Although, for financial reasons, development has not gone ahead as quickly as first hoped many new buildings have been constructed in a large area between Pennywell Roundabout in the west where the site of the former Gas Works and adjacent land, and Granton Harbour in the east. Many of the streets detailed have been newly formed in recent years, but some long-standing features of the area remain, such as Caroline Park House and one of the gasholders. By comparing the present-day map below with other maps on this website, you can see the considerable changes that have taken place. These streets are named after Caroline Park House, one of the finest large houses in the area. Caroline Park Grove was named in 1971 but the other street names are more recent. This street appears to have been named after a rock that lies just to the west of Granton HArbour, and which can be seen on the 1940 street map and maps of other dates. These streets are at the western end of what was the Granton Gas Works site. The origin of the name is unclear. This street was built in approximately 2010 immediately behind the former Custom House (now used as industrial premises) on West Harbour Road. The Custom House can be seen on the 1896 map and dates from about 1860. During the construction period the development was known as Shortbread Court. This street was previously known as Broom Park Avenue, named after Broom Park house and estate, shown on the 1896 map. The street was re-named to avoid confusion with a similarly named street in Corstorphine. This street dates from approximately 2009. It was built on a reclaimed section of the western part of Granton Harbour. This street is also on a reclaimed part of Granton Harbour. The name is presumably taken from vessels belonging to the Northern Lighthouse Board, which were previously based here. This street name refers to the Kingsburgh Motor Company, a later owner of the Madelvic car factory which was located nearby, on the opposite side of Waterfront Avenue. This street was formerly the Middle Pier of Granton Harbour but was renamed around 2005 when Corinthian Quay was built at the junction of the Middle Pier with Lower Granton Road. This street is named after Oxcraig, an island in the Firth of Forth with a lighthouse, formerly serviced from Granton by the Northern Lighthouse Board. These streets are off Waterfront Avenue. The reason for the name is unclear. The properties appear to have been built in approximately 2006. These streets are all close to the waterfront, and form part of the waterfront development area. They were formed on land previously in industrial use, part of the area having been occupied previously by Granton Gas Works. Waterfront Avenue and Broadway connect West Granton Road with West Shore Road. Waterfront Gait and Waterfront Park, along with Colonsay Close, View and Way form a group of streets near the west end of West Granton Road – Waterfront Park continues to join Waterfront Broadway near the Scottish Gas offices.. 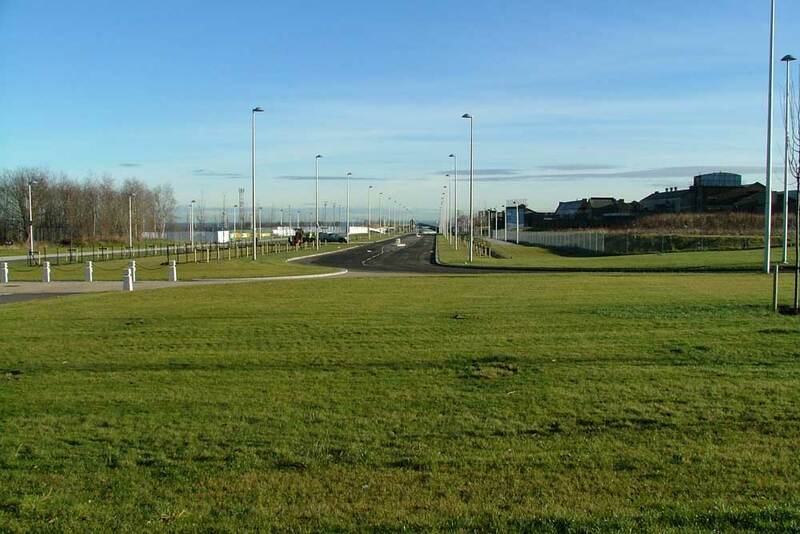 This new road was formed to improve access to the developing Waterfront area, and is built on the route of the former Caledonian Railway. The junction with West Granton Road was the location of a narrow bridge over the railway, which could accommodate traffic in only one direction at a time, and had traffic light control. This road seems to have developed gradually into a named, formal street. Even on the 1952 map it is not shown with a name. This road, which was a long-standing route giving access to premises near the shoreline including A B Fleming’s ink works does not seem to have had a formal name until recent years.